This blog will be dedicated to giving you a unique and truly local insight into Dutch culture! You keep hearing about borrels, gezelligheid and hospiteeravonds? Your Dutch friends say ‘Doe maar normaal’ and you have no idea what it means? Using the letters of the alphabet from A to Z, I will provide you with short anecdotes about places, phrases, situations and activities you will come across in the Netherlands on a daily basis. 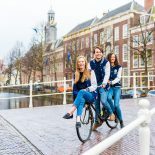 Rather than writing about all these ‘typical Dutch things’ that souvenir shops are stocked with – there won’t be much mentioning of clogs, tulips and cheese here – I want to give you an insight into what Dutch student life really is about. So here we go! This entry was posted on April 15, 2015 by Anne@theleidener in Student Life.